We were delighted to support Cosmpolitan Magazine&apos;s Fashion Masterclasses held on October 8th in London and October 9th in Manchester. We provided copies of Never Mind the Botox: Alex for their fabulous goody bags, that were packed with exciting products and treats for their fashionista audience. To find out more about the Masterclasses click here. We always like our books to be read by those that work in the same professions as our four leading women, so were delighted when former investment banker turned author, coach and blogger Girl Banker® agreed to review a copy of Never Mind the Botox: Meredith, describing it as "a bloody good story". You can see her full review on our Reviews page under "Web reviews". To find out more about Girl Banker® and about her book &apos;to Become an Investment Banker", click here. We are delighted to announce the publication of the third book in our series, Never Mind the Botox: Meredith. Given the trends in the market, for the moment we have published Meredith as an eBook only, however we will keep that decision under review. To celebrate the launch, the Never Mind the Botox: Alex is just 81p on Kindle for a limited period only. To find the series on Amazon click here. We are delighted that our great friends at Spabreaks.com have been listed at number two in Fast Track 100, the league table of the UK&apos;s top performing private companies. Spabreaks.com are the largest premier spa booking agency in the UK and have been our competition partner since the launch of our book series. Many congratulations to Abi Wright and her team. To see their listing in the Fast Track 100 click here. Penny has very much enjoyed going back to Deloitte to talk to them about life as an author since taking her career break from the firm. She has spoken at a number of events, including the Deloitte Women&apos;s Network and has written a piece for the Partner Alumni News. Deloitte also ran a competition on their intranet to win 50 copies of Never Mind the Botox: Rachel, which generated hundreds of entries and Penny has recorded a video interview for Deloitte TV. To read the article in the Partner Alumni news, click here and to see Penny&apos;s video interview for Deloitte TV click here. Our 1000 book giveaway that we ran with Spabreaks.com in June was so popular that we are running it again! Get a free copy of Never Mind the Botox: Alex with every Spabreaks.com booking. For more details see our Events page. Joanna was a guest today on the Eamonn O"Neal show on BBC Radio Manchester to discuss trends in cosmetic surgery for men. They discussed what is behind the fast growth in this area of the industry and why views on cosmetic surgery for men differ across the generations. To hear the interview in full see our YouTube Channel. We are delighted to be supporting the charity Fashion For Good by providing copies of Never Mind the Botox: Alex for goody bags being given out at the Surrey Fashion Weekend catwalk show on Friday 9th November. It should be an amazing weekend and well done to all those involved. For more details about Fashion For Good please click here. Penny has been talking to Accountancy Futures about the issues facing women in accountancy today and the important role that mentoring plays in helping women achieve their potential, based on her 20 years of experience in the profession. To read the full article click here. We&apos;re very excited to be running our biggest promotion yet with Spabreaks.com - a 1000 book giveaway of Never Mind the Botox: Alex. For full details see our Events page - click here. We&apos;re very much looking forward to the London Book Fair being held from 16th-18th April 2012 at Earls Court. They have a fascinating programme of seminars, interviews, workshops and demonstrations scheduled and it will be great to catch up with our contacts too. Today we are in the "Hot Tub" talking to our lovely competition partner Spabreaks.com about the Never Mind the Botox book series. They are Europe&apos;s largest Spa experience website with more than 500 resorts throughout the UK, Europe and the Rest of the World. Spabreaks.com have been our competition partner since the launch of the series, providing us with wonderful spa days, spa breaks and vouchers as prizes for our competitions. To read the interview with us click here. To find out more about Spabreaks.com click here. In 2004 Penny was listed in Accountancy Age&apos;s "Young Accountants under 35 - The Ones to Watch". As Accountancy Age launch this year&apos;s list, she talks to them about what it meant for her and offers her thoughts on how to make yourself "one to watch" today. To read the article click here. To see Penny&apos;s original listing click here. Cosmopolitan lists Never Mind the Botox: Rachel in "hottest reads"
Cosmopolitan Magazine has listed Never Mind the Botox: Rachel at number four in its "hottest reads" guide, describing it as a "clever series" that is "glamorous, high-octane fun... best read with a cocktail and a smile". We are so thrilled to be listed alongside such brilliant authors as JoJo Moyes, Jane Costello, Sue Townsend and Jo Carnegie. A big thank you to the team at Cosmo for including us. To see the full guide click here. 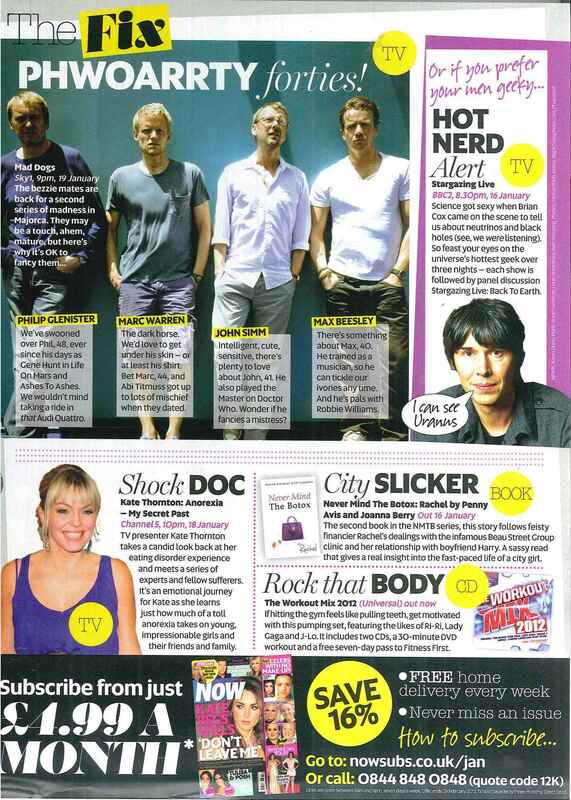 Star Magazine has reviewed Never Mind the Botox: Rachel giving it five stars and describing it as "fabulous fun", which is just what we hoped it would be! Now Magazine calls it "a sassy read that gives a real insight into the fast-paced life of a city girl" and Inside Soap has included it in their Entertainment Guide as the "book to be reading this week".